Our huevos rancheros recipe is a nice change of pace if you are tired of regular bacon and eggs for breakfast. I’ll have you making a semi-homemade salsa that’s easy and people will think you’ve been cooking all day. 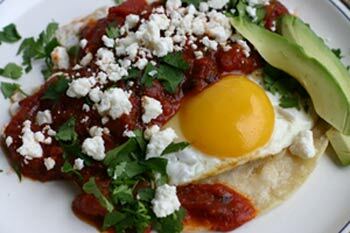 Doesn’t our huevos rancheros recipe look delish? You can make it as spicy as you like which is the beauty of this dish. Let me describe it a bit to you. Let me start with the semi homemade salsa. I’m calling it semi homemade because we are going to be using canned diced tomatoes and not just any tomatoes but fire-roasted. That’s going to give it some really nice flavor. We are also going to do a little something special with some tomato paste which will only take 5 minutes. This too is for extra fire roasted flavor. We will continue adding more tasty ingredients to our salsa and then simmer it a bit. Then I will show you how to soften corn tortillas which provides the base for this dish. We will cook the eggs sunny side up, or however you like them. You can even scramble them if runny yolks sends you running. We will then be ready to put it all together and top it with cotija cheese which seems to make it more authentic according to some. Cotija cheese is a crumbly cheese that doesn’t melt. So if you are expecting gooey cheesy, you need to switch cheeses. Monterey jack or a Mexican blend will work great. Garnish with avocado slices if you wish. Yum. This recipe makes enough salsa for about 8 egg servings. The salsa will keep several days in the refrigerator. Perfect for making huevos rancheros later in your week. Or you can make a casserole out of this recipe. I’ll give directions for making this a huevos rancheros casserole at the end of the recipe. In a large frying pan, heat 2 tsp. olive oil over medium high heat and add the tomato paste. Stir the paste until it starts to brown, about 4 to 5 minutes. Don’t let it burn. Add another teaspoon or more of olive oil and add the onion and a little salt to the pan. Add the jalapeno too if you are including this. Cook the onion mixture another 5 to 8 minutes until soft, stirring frequently. Pour the fire roasted tomatoes, green chiles, cumin, and chile powder into the onion mixture, stir and simmer for 10 minutes. In a smaller frying pan, heat 1/3 cup of olive oil over medium high heat. When the oil is hot, lay one or two corn tortillas at a time into the hot oil. After about 5 seconds turn the tortillas over for another 5 seconds. Make sure the oil is hot enough so that the tortillas bubble up quite a bit. Here is a little tip for making the best huevos rancheros recipe. Softening the tortillas in hot oil is where you get a whole lot of flavor. Don’t think you can skip it and just cover the tortillas with sauce. It won’t work and you will be disappointed. Remove the tortillas from the hot oil and lay them on a paper towel covered plate to drain. Pat dry. When you are done cooking tortillas, pour out all but a teaspoon or two of oil. Turn the heat to low and crack an egg or two into the pan. Try not to break the yolk. Let it cook for 3 to 5 minutes until the whites have set or to your desired consistency. Now you are ready to plate up your huevos rancheros recipe. It’s a nice touch to use a warmed plate. You can achieve this by placing your plate in the microwave for about 30 seconds or so. Place a little bit of rancheros sauce in the middle of the plate and lay a softened corn tortilla on it. Then carefully place an egg on top of the tortilla. Ladle more huevos ranchero sauce on top of the egg. Garnish with cotija cheese, chopped cilantro, and some slices of avocado. Serve immediately. Mexican coffee would round this out nicely. As a casserole you can make 8 servings which means using 8 eggs. With a casserole you may wish to use a melting cheese instead of or in addition to the cotija cheese which doesn’t melt. It’s up to you. Monterey jack or a Mexican blend work well. Make the rancheros sauce as above. Line a 9 x 13 oven proof dish with 8 softened corn tortillas just like above. Let the tips of the tortilla stick up above the dish a little so you can see them. It’s fine if the tortillas overlap. Spoon a layer of sauce over the tortillas. Then cook the eggs in a large frying pan. You may have to do it in batches, say 4 eggs at a time. Carefully place the cooked eggs in the casserole trying not to break the yolks. I know you can do it! After all the eggs are in the dish, you decide if you need a little more rancheros sauce. Don’t skimp here as the sauce makes the dish. Sprinkle cheese over all and place in the oven under the broiler (at about the middle of the oven) to just melt the cheese, for 30 seconds to 2 minutes or until the cheese melts. That’s it. I hope you enjoy this recipe as much as I do. Let me know how you like it by leaving me a comment. Return to more breakfast recipes and try our Easy Breakfast Casserole. Click here to watch my Huevos Rancheros Recipe video. Return from Huevos Rancheros Recipe to More Mexican Food Recipes.